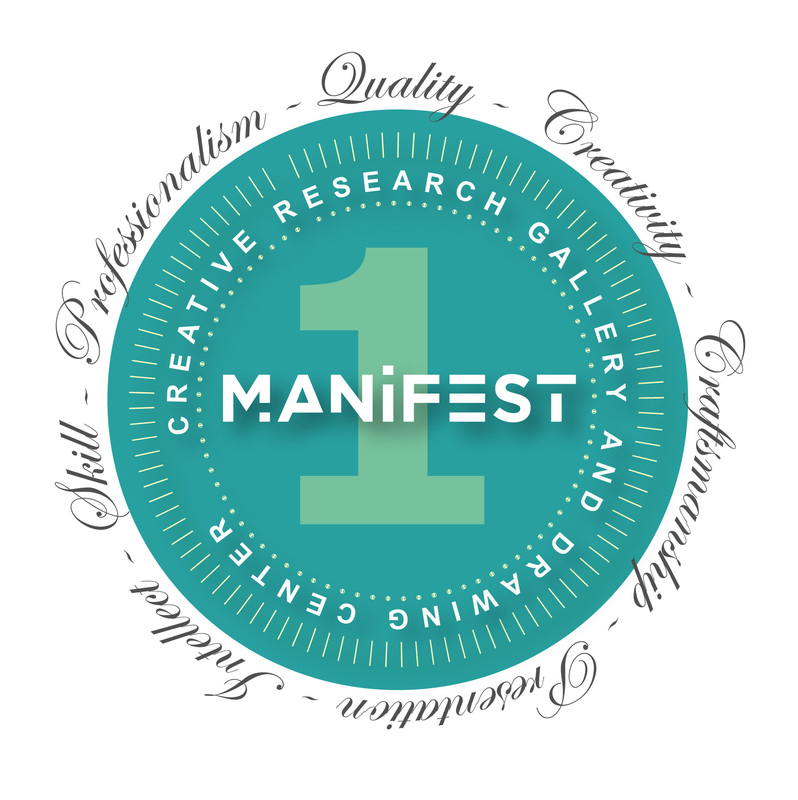 A $2500 cash prize awarded to the best of the best of each season of gallery exhibitions at Manifest. The prizewinner will be selected from among a pool of the top jury-scoring works from across the season through a final end-of-year grand jury process. All current season exhibitors are potentially eligible for this prize. * Candidates will be announced by September 30, 2018. The Manifest jury process is conducted by a rotating peer group panel of volunteers who are artists and arts professionals from around the country and beyond. Panel makeup changes from exhibit to exhibit in order to eliminate trends from occurring, and to promote diversity in the types of work shown in the gallery. The process is always conducted as a blind jury where only the work in question is judged, not personalities, histories, achievements, education levels, or reputations. Manifest is a 501(c)(3) charitable nonprofit founded by artists for artists, now in its 15th season. Since its launch in 2004 the exhibition program has included works by nearly 2000 artists from all 50 U.S. states and over 30 different countries. Manifest's exhibits and publications combined have featured nearly 7000 works by over 2700 artists. Our organization has provided considerable support to working artists through all four aspects of its programming, and this continues to evolve year by year as engagement with the community and artists near and far increases. made since January 1, 2016. This will be the last opportunity to participate in this publication and drawing award until 2022! $2000 in prizes, with $1200 first prize. 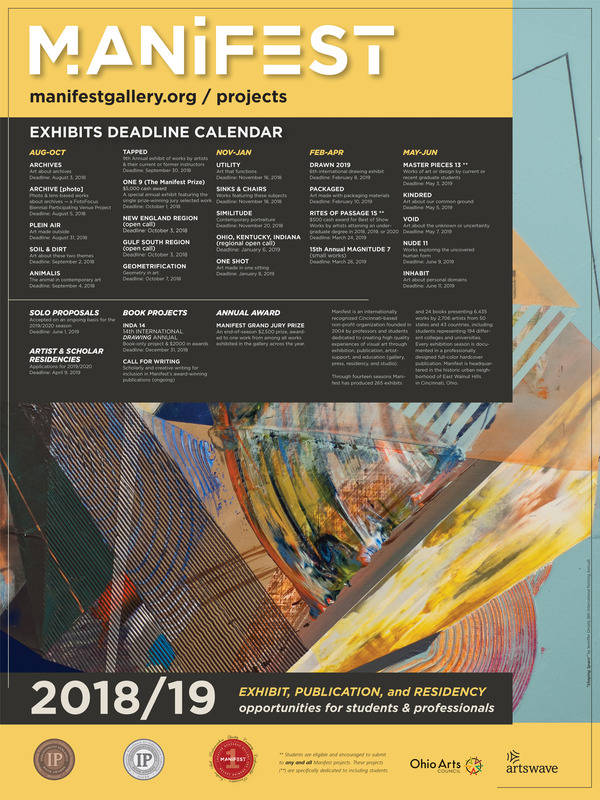 An annual exhibit of works by artists side-by-side with works by their current or former instructors, showcasing the legacy of the academic process in art. An expansion of our region-by-region investigation each year, calling to artists living in New England and the Gulf South for TWO separate exhibitions that will showcase head-to-head. A call for 2D or 3D works of any kind, in any media, featuring geometry in some significant way. An international call for functional works. A call for works of any media or genre featuring the ubiquitous subjects of either sinks or chairs. A call for works of portraiture of any kind, including non-traditional, experimental, and straight-forward traditional portraiture. A year-long free studio residency to support creative research. The program is open for application by any serious emerging or established artist, including recent graduates from college art programs. The award will include 24/7 use of up to a 500 sq.ft. north lit studio for one full year, exposure to Manifest's visitors during gallery events, free access to hundreds of hours of Manifest Drawing Center life-drawing sessions, darkroom, and more. Manifest is now seeking interns and volunteers for the current season and beyond. Ideal applicants will be quality-minded, responsible, and outgoing individuals. Students in any field of study are qualified, however successful applicants should have a reasonable interest in the art and design fields, art history, business, statistics, philosophy, sociology, etc. Internships at Manifest provide valuable hands-on experience with the operations of a small non-profit organization functioning at a level equivalent to most commercial or university galleries and many museums. Our interns often use their tenure at Manifest as a springboard to graduate school or full-time employment at museums and organizations around the country. Manifest is not currently hiring. But we are always looking for a few good volunteers!